XFactor Productions Inc., the talent-handling company brings together for the very first time the artists who were products of the reality singing competition in one concert performance! KZ Tandingan, Daddy's Home, Kedebon, Rox Puno, Onse, and Crub will join forces in one big musical event! This is Sythesis Vol. 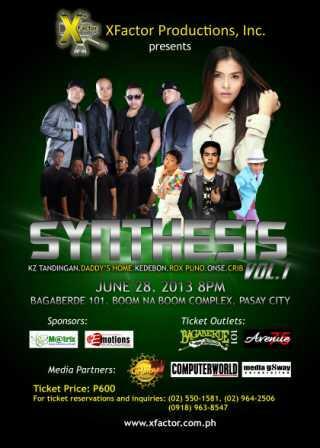 1 happening this coming June 28, 2013 at exactly 8PM. The venue is in the musical resto-bar, Bagaberde 101, located at the Boom na Boom Complex, Pasay City! The ticket price is at very affordable Php600.